Each week the Lovejoy Athletic Department would like to highlight the contributions of our amazing staff. 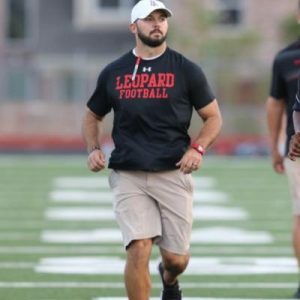 This week, Lovejoy would like to honor assistant football and wrestling coach, Cole Kiefer, for his contributions to the athletic program. Your time, hard work, and dedication to your student-athletes make a difference in countless lives. This past week, Coach Kiefer and staff started the football season off right with a 42-26 win over Frisco Heritage in the Tom Landry Classic. Thank you for all that you do Coach Kiefer! How many years have you coached and what schools have you coached at? What sport(s) did you play in high school? Football, Track, Baseball, Basketball, and Powerlifting. What is the most rewarding part of being a coach? Seeing the growth of our players as athletes and as young men. What coach has left a lasting impression on you and why? My high school football coach, Coach Seth Stinton. He was demanding but he cared about each of us, and we learned to put the team before ourselves from him. What is on your athletic bucket list? Coach a state champion team.